Sitting on my couch with my laptop burning the top of my legs, I took a break from my work to read that the Outlook Lodge in Green Mountain Falls, Colo. claimed that the pace would slow me down and the fresh air would clear my mind. I decided that this was exactly what my family and I needed. It had been a wild few weeks and we were in need of a retreat where we could relax and regroup as a family. Built in the late 1880’s, this rustic lodge just north of Colorado Springs was going to be just the ticket. We arrived after dark because of our work schedules. Parking is easy and is off of the main road. We got parked, grabbed our stuff, and walked up the stairs to figure out where we were staying. The Outlook Lodge prides itself on the hands-off service that it provides. While they have a local host and a concierge service, they don’t have any employees on site. When we arrived, we located the lockbox, which looks like a set of small mailboxes. We used the combination given to us, grabbed our key, and let ourselves into the lodge. The lights were left on for us so it was easy to figure out where we needed to be. We stayed in the Lodge Family Suite, which is located upstairs in the main building of the lodge. When you ascend the stairs, it opens up to a sitting room with a table and chairs perfect for a round of cards or board game. Off of the sitting room, there were three bedrooms with separate doors that locked. Two of the bedrooms both have bunkbeds and an inside door that connects them. The third bedroom has a queen bed but is not connected to the other two bedrooms. There are two bathrooms, one with a shower and one with a bath. 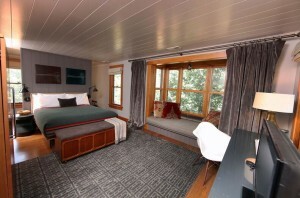 Rooms at the lodge can be booked on their own or you can book the entire lodge. I think this would be a great place to hold a family reunion. 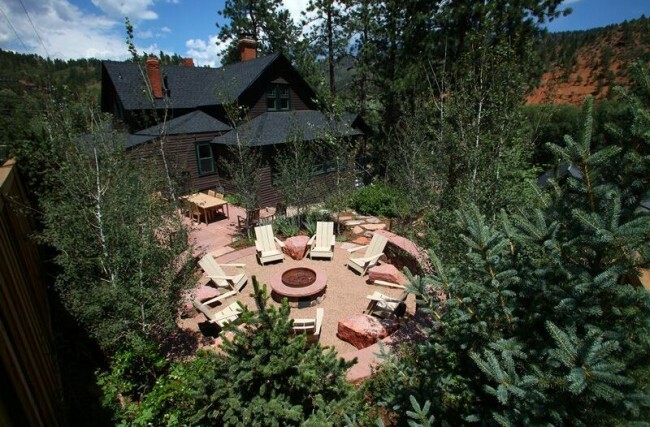 While staying at the Lodge, you have access to all of the public areas that include the kitchen, sitting rooms downstairs, fire circle, and the hot tub that is located at Little Beaver Inn. It is important to note that any guests staying at the Outlook Lodge or Little Beaver Inn have access to these amenities as well. The Lodge Family Suite has doors that lock on the bedrooms but the bathroom and sitting area are available for anyone to walk into. We were upstairs when another couple came up looking for their room. It didn’t bother us, but it did make me realize that personal belongings should not be left in the bathroom or sitting room. My children are old enough (9 and 11 years old) that we could have left them in their room alone at night but if I had small children I think that I would have moved them into a room with me. I could have spent all day sitting on the windowed porch with a book and a cup of coffee but we had places to explore. Saturday morning started with breakfast at The Pantry, a small restaurant within walking distance of the Outlook Lodge. My husband and I both went for the breakfast burrito (with the green chili on the side for me!) and my kids tried the French toast and the pancakes. The lunch menu looked great, too, but we didn’t have a chance to go back. If you are going to visit The Pantry, know that there might be a wait. After breakfast, we walked back to the car so that we could head into the Rampart Range to do a little sledding. Unfortunately, it had been so warm out that there wasn’t much snow but there was just enough for my kids to enjoy sledding for an hour or two. There was another group there as well so we weren’t the only ones trying to eek out a sledding adventure in the warm weather. The Outlook Lodge left us four sleds and a map to a popular sledding hill in the Rampart Range. This program is available to guests upon request until April 15th or as long as there is snow to sled on. If sledding isn’t your thing or you are visiting in the spring or summer, there are hiking trails to explore. Catamount Falls was recommended to us by Outlook Lodge and I am already making plans to hike it this summer. Flowers, a waterfall, and a rocky ascent will surely entertain my children. The burgeoning arts community welcomes local and national artists to locales around the community’s pretty Gazebo Lake in the summer. 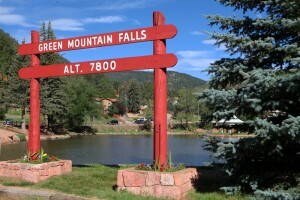 Green Mountain Falls is a short 15-minute drive to Manitou Springs where you can wander the shops and taste the mineral water that comes out of the spigots around town. We tried some lemonade made from the mineral water and I have to admit it was pretty tasty. The host left us a S’mores kit that can be added to a room reservation for $20. You can also bring your own groceries and items for S’mores and you are going to want to. We spent an hour sitting around the fire pit, laughing, telling stories and roasting marshmallows. When it started to get dark, we headed back up to our rooms so that we could play one of the games left in the sitting room before calling it a night. When it was time to check out the following morning, both of my children proclaimed this to be one of the best weekends we have had in a long time. They loved getting to spend time with us with no outside distractions and it was just what we needed. Thanks to the Outlook Lodge for hosting! Jennifer Close is a teacher librarian and travel blogger. In 2012, her family left the beaches of Pensacola, Florida for the mountains of Denver, Colorado. She likes to read, craft and look for adventures with her children and you can find her at Two Kids and a Map. Thank you to Winter Park Resort for providing the Adventure Pass to facilitate this review; all opinions and adventures are her own. This looks awesome! I love cozy retreats and I’d never even heard of Green Mountain Falls. Who knew such a fabulous place could be tucked away in the small town of Green Mountain Falls. This might be one of our new favorite properties in Colorado! So quiet and serene—of course, the fact that we practically had the Lodge to ourselves added to the ambiance. Lovely outside space with firepit, tables, etc. And can’t say enough great things about the lodge and room itself. We chose the Deluxe Upstairs Carriage house room and couldn’t have been happier. 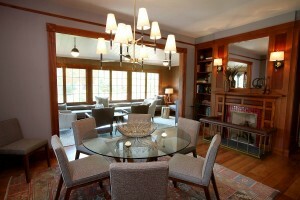 Probably the nicest amenities we’ve seen in properties of similar cost/quality. Bed was so comfortable, and just loved the Euro-mountain feel of the décor. This looks like a great place! I noted the hike, thinking we’ll have to check it out this summer.